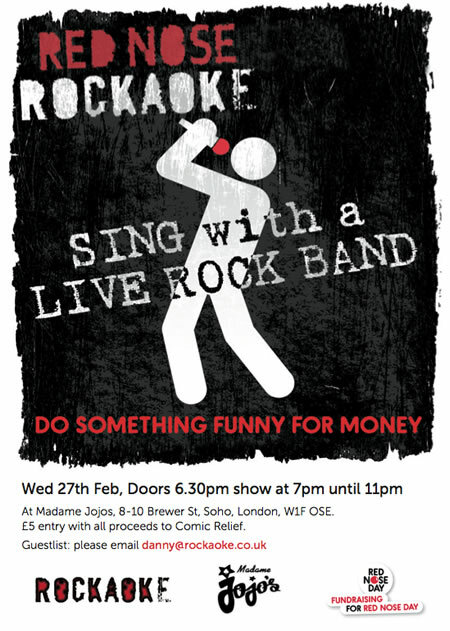 … GRAB YOUR MATES, A RED NOSE, AND PREPARE TO LIVE THE DREAM WITH THE WORLD FAMOUS ROCKAOKE BAND! ROCKAOKE are fundraising for Red Nose Day again, this time by hosting a special event where DARES are the order of the day. Why don’t you pay for your friends to sing a song of your choice? If they bail they have to pay double to get out of it! Either that or leave it in the hands of the Rockaoke Gods by picking your song out of a hat (well it’ll be one of Basil’s bandanas actually). ALL PROCEEDS DONATED TO COMIC RELIEF…! Date: Wednesday 27th February 2013. Time: Doors 6.30pm, show at 7pm til 11pm.